In May 1848, William returned to Toronto and was warmly welcomed back by the Presbytery. During his time in Louisiana and on the road back to Canada, William had developed in his own mind the idea of establishing a settlement for both his own and other slaves that had escaped their masters and found freedom in Canada. In June he attended the Synod of the Presbyterian Church of Canada (the “Free Church”) and presented his proposal. The Synod was favourable to the idea and formed a committee including Rev. Dr. Michael Willis and Rev. Dr. Robert Burns, to assist William. 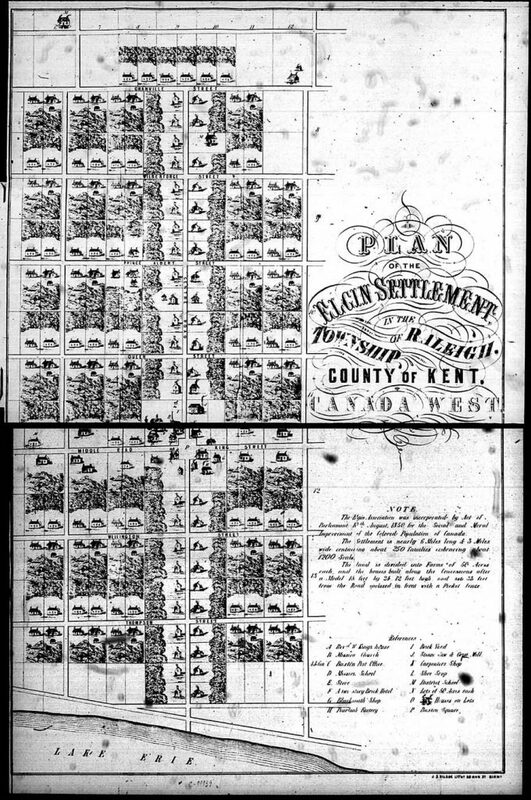 This committee in turn helped form the “Elgin Association” (named in honour of the Governor-General, Lord Elgin) which raised the required sum of $4,000 needed to purchase the 9,000 acres of land near Chatham which was chosen by William as the site for the new settlement. William was named the managing director. A “memorial” protesting the formation of the settlement was signed by a number of citizens from the area and a “Committee of Vigilance” was created to follow and report upon William’s actions and the work of the Elgin Association and to draft and send petitions against the settlement to the Parliament. William stood strong against this opposition, and at times risked his life in founding the settlement. Once the 9,000 acres was purchased, Rev. King worked with the surveyors to partition the land into blocks of 50 acres. These lots were made available only to black settlers, who were required to pay for the land. The cost, however, was low and could be paid off over 10 years. The nucleus of the settlement became William’s own former slaves, who were now offered lots in the centre of the settlement. William himself purchased a 100 acre lot right in the middle and in December 1849, began the mission that he would continue for the next three decades.